Delicate apple pie. In winter, fresh apples, you can replace with canned. Recipe was found in Soviet worker. 1. Knead dough from, 4 tbsp of sugar, margarine and yolks. 2. Wash apples, dice finely. 3. Roll dough and spread it in greased with margarine cake form, poring edges at 1-2 сm height. 4. Mix egg whites into thick foam, gradually pouring 2 tbsp of sugar and starch. 5. Combine mixed whites and diced apples. Stir all well. Spread mass in from with dough. Bake for 40 min at 180℃. Taste pie with apples is ready. Bon Appetite! 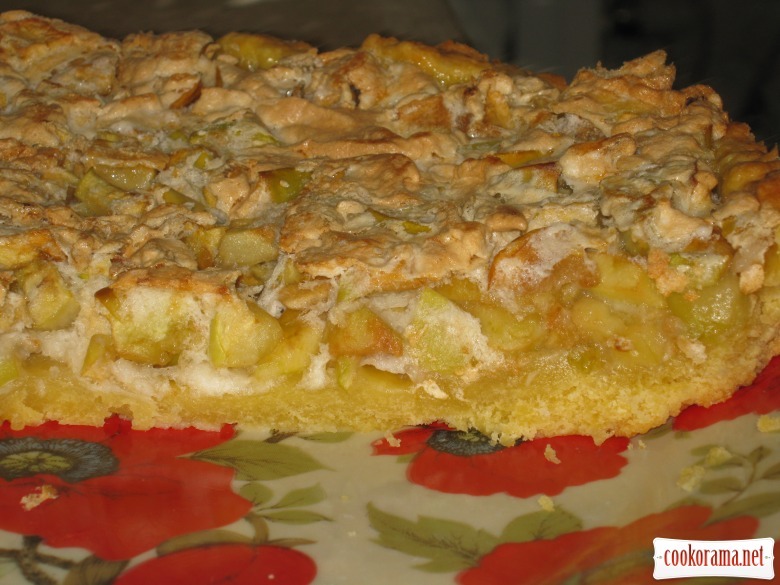 Top of recipe "Pie with apples "Try""
очень понравился пирог! обязательно испеку! Спасибо! Но до ваших пирогов и тортов еще далеко(((( У меня все еще впереди. Маргарин растапливать или порезать кусочками или просто, чтобы был мягкий? Recipes, Pies, Pie with apples "Try"